When it comes to managing content that’s been copied by the system, the Windows clipboard leaves a little something to be desired. Sure, it’s definitely useful as you can copy a whole slew of different elements including media, text and more. However, you can’t really edit or customize the various clips. Even worse, when you need to copy two alternating strings multiple times, the whole process can become tedious. With the stock clipboard, you have to copy, then paste, then copy again, then paste, then copy, then paste, and so on and so forth. 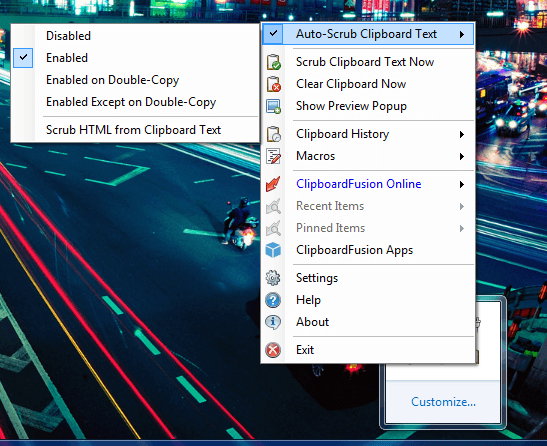 ClipboardFusion is a Windows application that changes that process and simplifies everything. With it, you can use a more advanced clipboard with features like text scrubbing, replacing text with custom strings, creating macros and more. 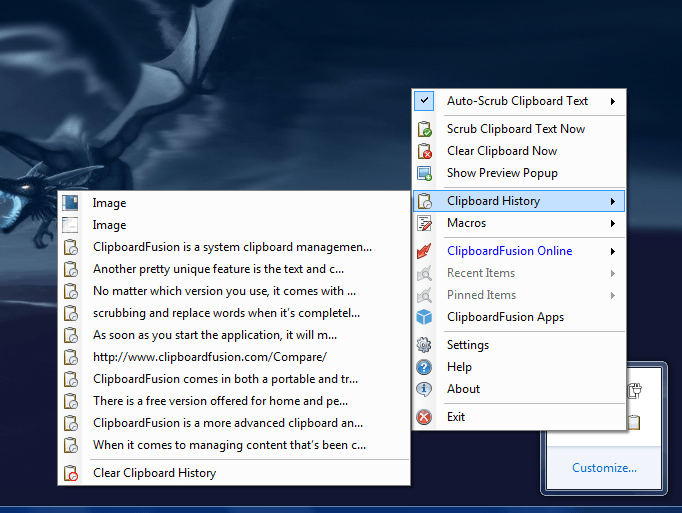 ClipboardFusion is a more advanced clipboard and management tool than the stock Windows function (copy and paste). There are many similar tools out there, but you’d be hard pressed to find some of the features offered in this one. One of the most interesting features is that it can scrub clipboard text automatically, removing all formatting in the process. It can also replace any text with custom strings, and utilize user-created macros through C#. Furthermore, it runs quietly in the background, and remains hidden down in the system tray until needed. There is a free version offered for home and personal use, but you get a 30 day trial of the pro variant when you first use it. 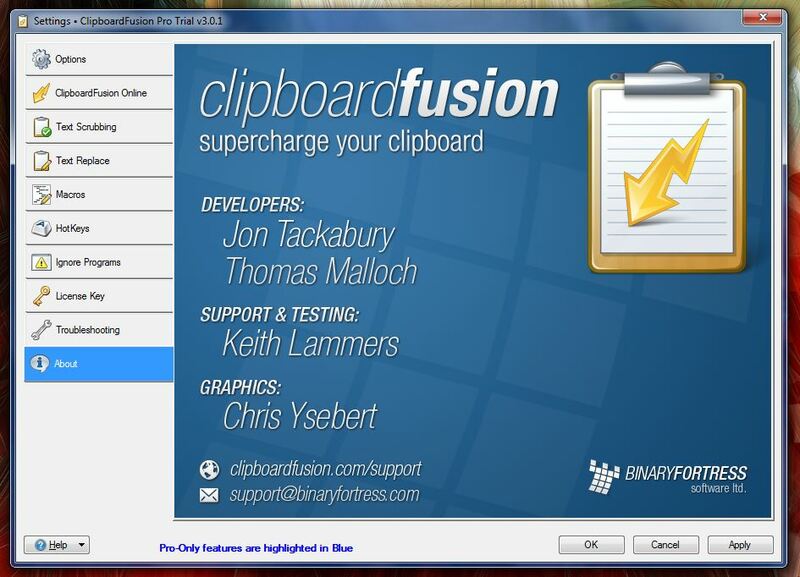 ClipboardFusion comes in both a portable and traditional install package. Obviously, if you choose to go the portable route you’ll need a tool like WinZIP, WinRAR or 7ZIP to extract the compressed archive. Once extracted, it can be run from any directory including that of an external drive. Both variants turned up clean when scanned with VirusTotal, and you can see the links to the results in the conclusion of this review. I chose to use the portable version, so for the purpose of the review please keep that in mind. 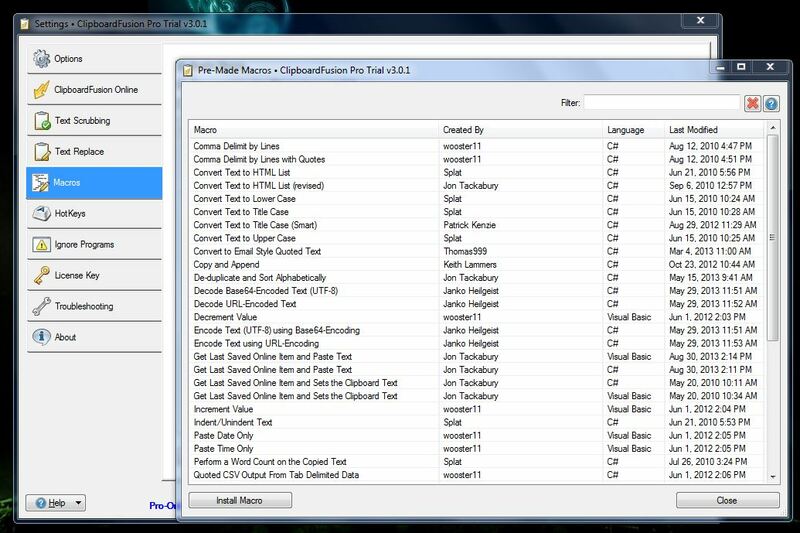 No matter which version you use, it comes with a 30 day trial for the Pro variant of ClipboardFusion. The Pro version offers many extra features, most notably the ability to copy text and share it cross platform with Android, iOS and Blackberry devices. I’m not going to do my best to stick to the features offered in the free and personal version only. If you’d like to see a side-by-side comparison of what the two versions have to offer, visit this page . As soon as you start the application, it will minimize to the system tray. This is where it resides until you perform an action associated with it, like copy or paste. By default, the application is set to auto-scrub any copied text. What does that mean exactly? It’s quite simple really ClipboardFusion will clear formatting for any copied text right away. This saves you from doing it yourself when moving content between various platforms. For example, I use WordPress quite often for web authorship, yet I write all of my articles and content in Microsoft Word or Google Drive. The formatting can be extremely wonky when I copy and paste it from Word or Drive over to WordPress. ClipboardFusion saves me a few extra steps by clearing the formatting already. Now, if you would like to retain formatting you can disable the function at any time. If disable, you can scrub the text manually through the system tray icon. You can also enable an option that scrubs the clipboard text when you double click on the icon. Another pretty unique feature is the text and character replacement function. 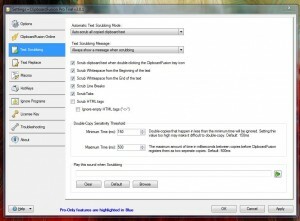 You can replace very specific points and strings through custom user-defined settings. For example, let’s say the word “apple” was used frequently and you wanted to change all instances to the word “orange,” you could do that very easily with ClipboardFusion. Okay, great, so what? Well the function in this app actually replaces the content while it’s stored in the clipboard. 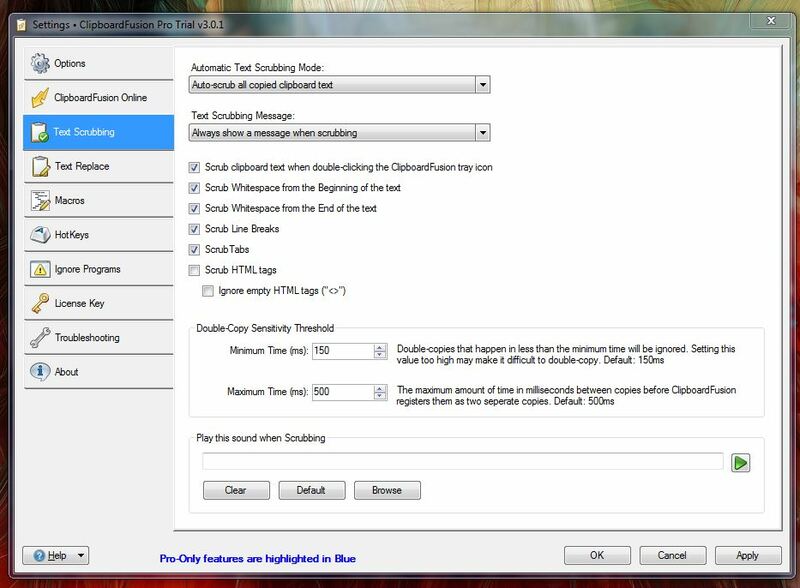 You can also enable a setting that replaces the custom variables while the content is scrubbed. That is useful on its own, because you could disable auto-scrubbing and replace words when it’s completely suitable. ClipboardFusion also fully supports macros. 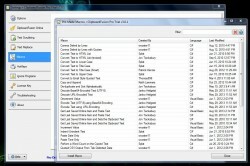 You can create your own macros from scratch, or you can download others from the community. With macros you can do things like converting text to HTML, performing a word count on the copied text, sharing a link on Facebook, scrubbing URLs from the content and much more. Macros pretty much allow you to automate custom tasks with the help of the native app- which in this case is ClipboardFusion. Now, we’ve spent a lot of time talking about the unique features, so let’s move on to the more common ones. This app interacts directly with content copied to the system clipboard. Every time something gets copied it delivers a small notification bubble just above the system tray. If content is scrubbed then ClipboardFusion will explicitly tell you so. You can designate hotkeys to perform various functions, and you can also add a whitelist of programs which the app will ignore (when clipboard changes are concerned). You can see the clipboard history, and clear it completely if need be. If you select a previous clipboard entry from the related list, it will be added to the clipboard again. All of this can be done through the system tray icon, or more specifically after you’ve right clicked on it. If you’d like to keep the app running at all times, there is an option in the settings menu that allows you to start it automatically when Windows boots. This would ensure that you could leave it running and not have to worry about it. ClipboardFusion uses just under 11MB of RAM while running. 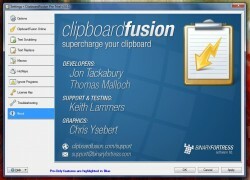 ClipboardFusion is a system clipboard management and enhancement tool that also comes with several unique features. Like similar apps, you can manage, recall and edit clipboard content as you’d expect. However, you can also scrub the copied text clean of any formatting, replace strings and words entirely, or even use macros to achieve a specific task. It runs quietly down in the system tray, and can be called upon at any time. It uses about 11MB of RAM while running, which means it’s not demanding at all. Furthermore, you can setup the app so it runs at Windows startup leaving you never to worry about fidgeting with it- for the most part anyway. I recommend reading the full review above for a more complete look at the app. If you’re in the market for a clipboard management tool, ClipboardFusion is certainly a good one, better than most others that are out there I would say. Also be sure to check out dotTech’s review of best free clipboard manager for Windows .